eat, drink & be vegan: The Next Generation of "Chopped"
The Next Generation of "Chopped"
I watch Chopped on the Food Network. If you aren't familiar with it, the program goes like this: there are 4 contestants that go through three rounds to become the Chopped champion and win $10,000. With each round they are presented with a basket of "mystery" ingredients that they must use in their dish. At the end of each round, the dishes are evaluated by three judges and then one contestant is eliminated, or "chopped". This is a keepsake for sure, I just love it to bits. But... then... they announced that they want to test the recipe "for real life". Oh dear. Give me strength grinning through that taste-test! The solution to losing weight is a whole foods, plant-based diet, coupled with a reasonable amount of exercise. It is a long-term lifestyle change, rather than a quick-fix fad, and it can provide sustained weight loss while minimizing the risk of chronic disease. That lasagna looks incredible, I can not wait for your new cookbook to come out! Recently I asked my oldest (she's 6) what she wanted to be when she grows up. My daughter - "I want to be you mom!" Me - Really?! Thats so nice! My daughter - " Yeah I'm just gonna cook, cook, cook!" Well alright then....I guess I really do spend a lot of time in the kitchen! I have a feeling when your new cookbook comes out I'll be spending even more time in the kitchen - maybe with a new little helper! I love Chopped too! And "the girls" sound adorable. Enjoy! Growing up did you ever watch Just Like Mom? Your kids' recipe reminds me of that show. Oh my. I was reading this post on my blog reader instead of the site and all I saw was the girls' recipe. I thought, "Has Dreena gone crazy?! Ew!" Cute story, though! borntobevegan - ha, that's cute, and revealing, huh? I've heard similar things, like "mom's always in the kitchen", and also "mom's always home". oh well, they could be saying much worse about what we're doing! Stefania, I'm not familiar with that one, I'm gonna have to google it, now I'm curious. Sometimes its actually edible! The lasagna does look fab! Looks like there are many creative cooks at your house! And who knows, marshmallows-and-capers might be the new chili-and-chocolate! 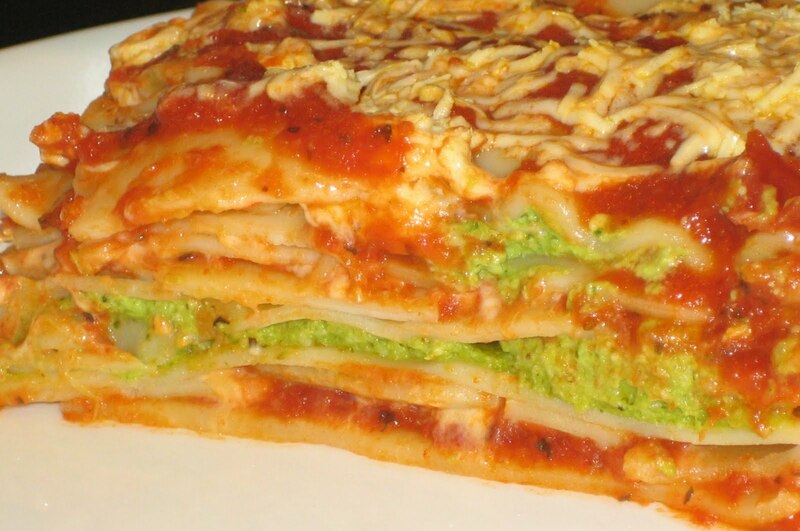 The dip recipe sounds out of this world, and that lasagna pic is mouthwatering! I want to hear how the recipe test works out! Did the girls like their creation? We have been reading the articles on your website http://vivelevegan.blogspot.com/ and are very impressed with the quality of your information. i swear i would give my eye tooth, heck, i'd give you both of them, to become a test tester for YOUR recipes. maybe i can get the kids to test the chopped version. i went out and bought eat drink and be vegan again since my old copy bit the dust. i'm cheap as hell, and for me to buy a brand new cookbook? that never happens. for me to buy a new cookbook twice? laws.